Blogging is fun, an adventure, can be incredibly satisfying and also financially rewarding when you "blow". I started blogging over 6 years ago and like I've mentioned in a lot of blog posts and I did not really start making money till about 2/3 years ago. Blogging was a hobby for over 4 years but after a while I had to give myself brain when I realised I could actually turn it into a career which is what I am doing now. I am a full-time blogger in Nigeria and it was not easy making that transition but I can tell you that it is possible. Let's talk about how I made my first Million+! I was interviewed by TopNaija and like all interviews I was asked several questions. I talked about how I started blogging, how I film my videos and how I made that money, Click HERE to read. Do you want to start a blog or you already have one and thinking of how to make it successful? Check this post out HERE, It is just for you! Awww! Love the interview Sisi!! Congrats and many more more achievements to come! yay! !Thanks Sisi!How do we get biko?As for the interview I don read am teh teh.Btw my link is opening someone else's site. Sisi love you for your humility and truth.You've got a beautiful personality.For the food aspect I love you more because #LOVEFOODSOMUCH. I mean good tasty food. Winning something always feels good. Thanks again Sisiyemmie. I loved the interview Sisi (you are an inspiration). I wish you more success! You inspire me Sisi! Lovely interview. Cheers to many more. Congrats, sisi! The interview is such an inspiring read. "It is also cool that I am a full time blogger and work from home – this is something I’ve read about, dreamed about but now I’m living it!" There's nothing like seeing your dreams come to pass. Dreams come true when they are worked for. Here's to more blogging success! Just read your interview at topnaija...a site I equally stumbled on as yours. Kudos to your efforts here as a mum and wife and fro your own personal goals. I just stumbled on this site. Great work! This is a succinct but instructive interview. "I will give her two quick advice for monetary reward from her efforts. A) She should try to develop her mailing list immediately. Engage with such subscribers and later on she can deploy series of short courses ONLY requested from her readers. B) Many online businesses forget there is much to be made offline. What do I mean? She should with time arrange a very small pilot event- after asking her readers of what they would want from here offline- . Let this event happen and that will be an additional expereince for her visitors. At least for those in Lagos. Time will not give the opportunity here to put more flesh to a) and b) Kudos to her and the interviewer." I will get in touch in due course. Wow! I was really impressed by your interview. Please do more blog posts for newbies like us who are just getting there feet wet in the blogging world. Thx! Hello Sisi Yemmie, I have left my stalking on YouTube and brought it here. Please answer my quetsion on the vlogging in Nigeria, equipments, software and the likes. You know me love you long time. I do hope you'll be at Mente de Moda this Saturday. I have a gift for you at the Kamari Luxe stand. I never been to this place, today is my first day but it keeps looking as if, I am a fan of yours. You are truly a role model. 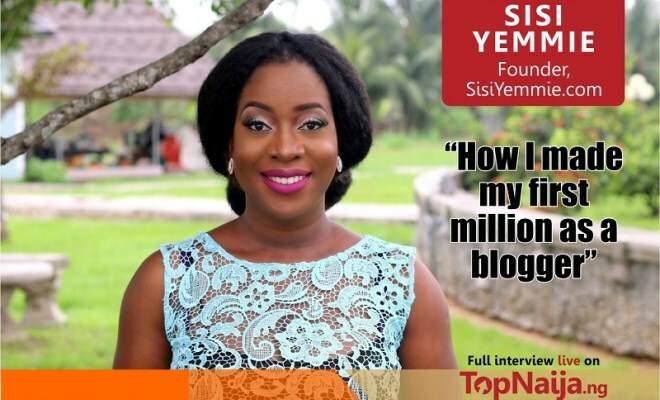 Sisi Yemmie forever inspiring us, Love the new logo/header! I agree with Muyiwa, your loyal fans would love to attend a workshop/session by you on the business of blogging. This is exactly what today's bloggers need, that drive, that push to carry on even when the fame is not there yet although i'm not excusing the fact that most of us want it(fame) now. Very Nice Collection.Thnx for sharing keep up the Good work..
Keep up the great job, am inspired to continue as a 7 months old blogger.